UK-based French artist Camille Aubry is another creator I had the pleasure of meeting last year when I was involved with giving portfolio reviews at the East London Comics and Arts Festival (ELCAF) ‘Springboard Meetings’. 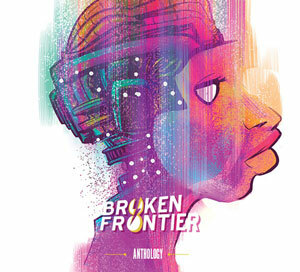 As a follow-up for each of the aspiring comickers I saw that day I said that, should they self-publish new work over the course of the next year and send it my way, then I would give them some review time at Broken Frontier. Following up on that initial feedback seemed very much in the spirit of BF’s ethos as a site after all. 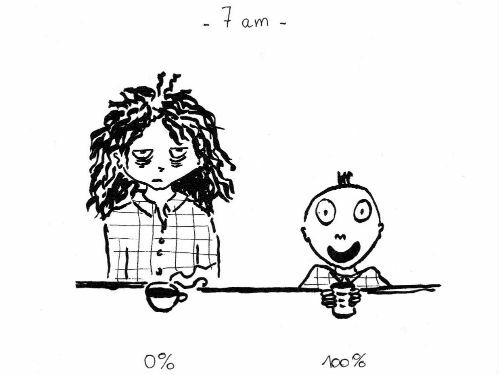 What I immediately noticed about Camille Aubry’s work was its versatility in terms of scope and the subject matter on display (check out her website for more examples of that) but it was her autobio material that particularly stood out. 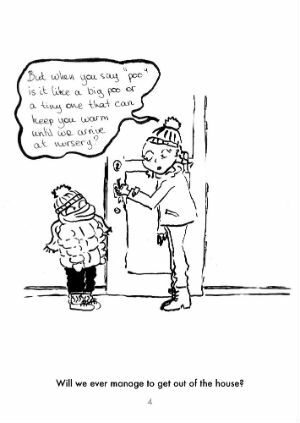 She’s recently added to that strand of her practice with a collection of a number of cartoons about her experiences as the parent of a young child in Toddler Moments, subtitled ‘A Petit Book’. 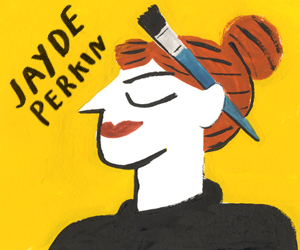 Aubry was also recently announced as one of the longlisted artists for the Laydeez do Comics Competition, underlining the promise I saw in that initial portfolio discussion. 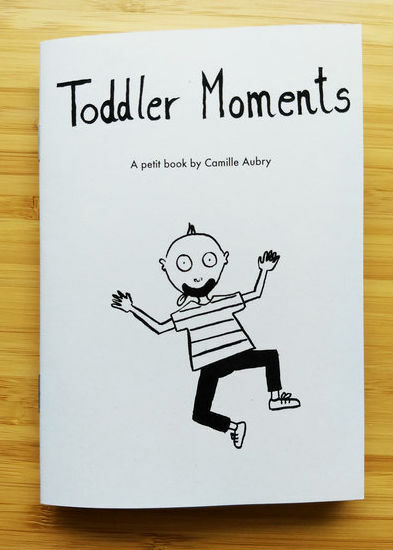 Toddler Moments is perhaps not, technically, sequential art – consisting as it does of around thirty mainly individual cartoons. They trace the trials, tribulations and triumphs of bringing up a small child as they first begin to discover and interact with their environment. 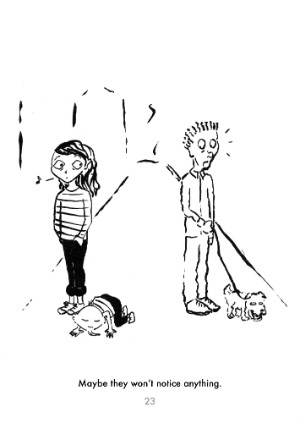 In combination, though, these individual vignettes do build up into a charming and amiable narrative in their own right and there are occasional diversions into sequential imagery within their number. 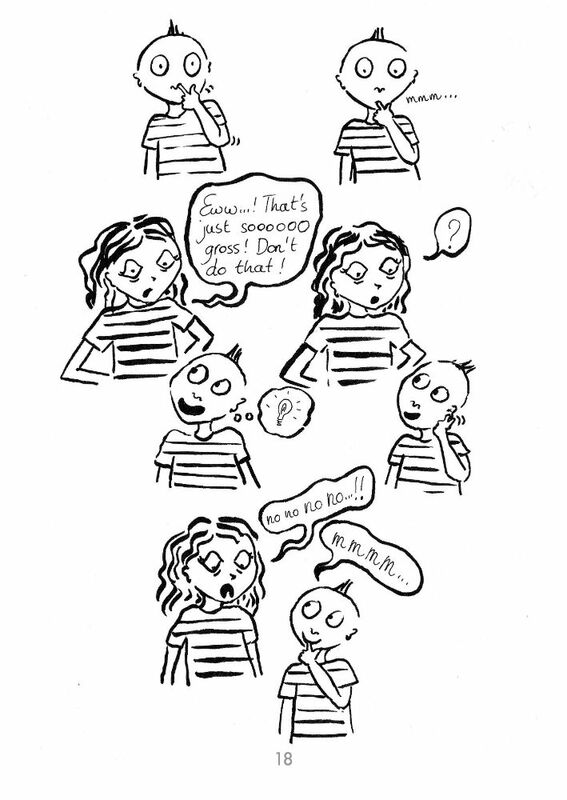 Aubry’s cartooning recreates a succession of what will, no doubt, be very recognisable moments for the parents among her audience. Her son’s unwitting disruption of her attempts to work from home, for example, or his doodling on the walls of their home. 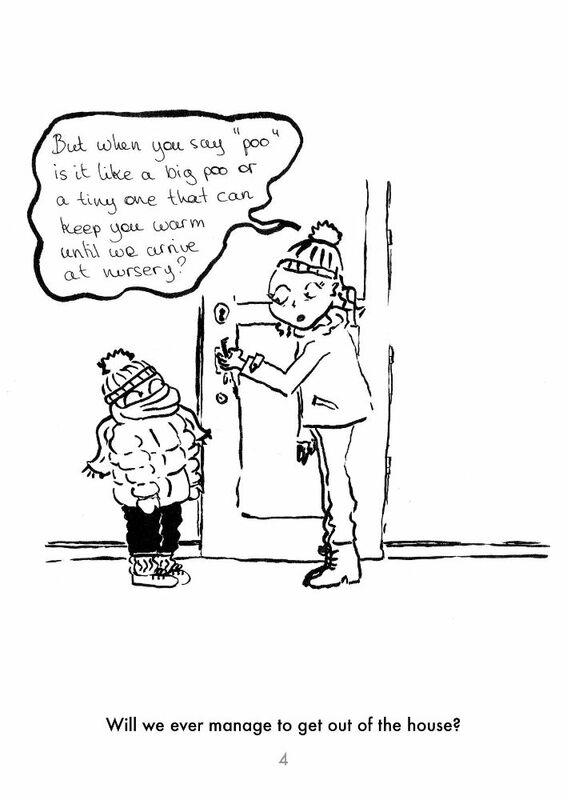 Refusals to go to bed, random tantrums and parent-exhausting questions are just some of the focal points of a brisk but ever smile-inducing minicomic. While that subject matter may sound like well-trodden territory it’s Aubry’s own spin and additional asides on these experiences that make this such an amiable read. 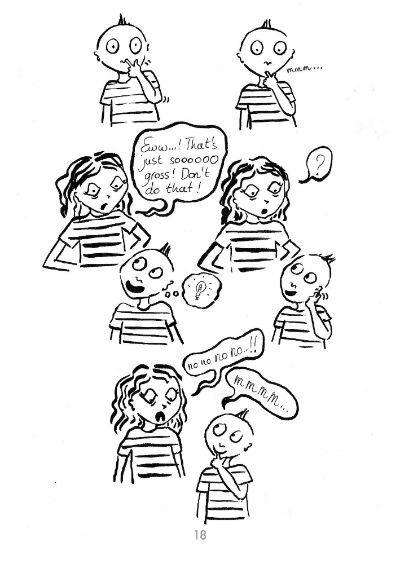 A short one-page strip of her toddler son responding to being told not to pick his nose and consume its contents by ostentatiously eating his ear wax instead is followed by the dry caption “I shall print this cartoon on his 18th birthday cake.” It’s these instances of droll commentary that give a witty personal edge to observational humour that may have seemed amusing but overly familiar otherwise. Visual characterisation is acute throughout with so much of the book’s comedic effect coming from the expressive depictions of the characters, from the often weary resignation of Aubry’s on-page incarnation to her son’s sense of everything from wonderment to frustration at the world around him. 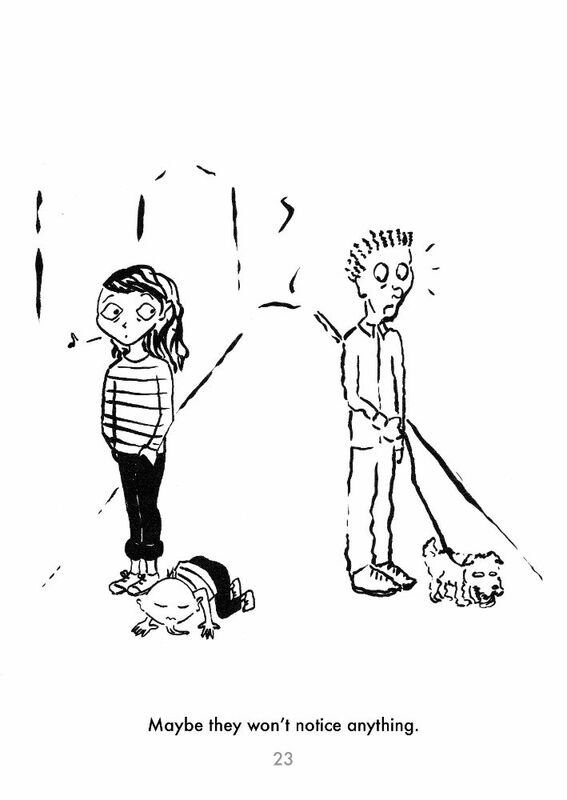 It’s all brought to life with a lively, slightly scratchy and inky fluidity that underlines the essence of their relationship – of not just the obvious love but also the feelings of fond exasperation that parenthood embodies. This is autobio that, ostensibly, isn’t concerned with the confessional or the revelatory and yet to dismiss it as ephemeral or light in content would be a mistake. There’s something universally profound about what Aubry captures in these brief snapshots of family life that will appeal to the broadest of readerships. Toddler Moments is undoubtedly sweet and endearing on a surface level but its toddler-based slapstick and punchlines contain a hidden depth. For more on the work of Camille Aubry visit her site here and follow her on Instagram here. 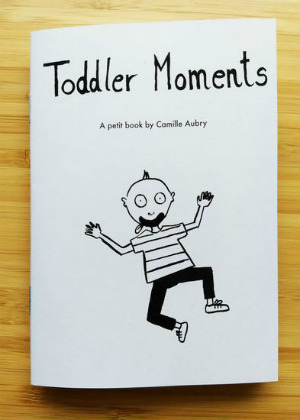 Toddler Moments is available on her online store here priced £5.00.